First off, about 4 years ago, we threw away our Teflon coated cookware, for similar reasons as Mr. Patterson, not to mention little pieces of the Teflon flaked off in our food, and were being ingested. Not healthy. However, after years of making beautiful omeletts with Teflon, suddenly, everything started to stick to the pan. Thus, we were excited to read about this new method. Food: The Way We Eat: Which Came First? This method requires a degree of blind faith. After all, pouring cold liquid into hot liquid promises to yield little more than murky yellow water. Following a lot of trial and error, I came to a few basic steps that lead to perfect eggs every time. The most important factor is using only the thick whites and the yolk. At first I could get this technique to work only with very fresh farmer's-market eggs, whose viscous whites are high in protein (the main bonding agent). As eggs age, the thick part of the white erodes, and the thin, watery part increases, which is why fresh eggs (less than one week old) are best for eating, and older ones are better suited for meringues. This flummoxed me until a quick e-mail message to my friend Harold McGee, the food scientist and author of "On Food and Cooking," solved the problem. He discovered that using supermarket eggs is just fine if you start by cracking each one into a slotted spoon (or sieve) and let the thin white drain away, then work with the remaining thick white and yolk. After saying a quick prayer and adding the eggs, cover the pot and count to 20. Almost instantly the eggs will change from translucent to opaque and float to the surface in gossamer ribbons. This all happens very quickly, and by the time you lift the lid, they should be completely cooked. Tilt the pot over the strainer while holding back the eggs with a spoon, and pour off most of the water. A few bits may escape, but the strainer will catch them. When the rest of the water has drained, gently slide the eggs into the strainer and let them sit there for a minute while you get bowls or remove bread from the toaster. very happy with these: extremely fluffy. Just needed salt, and a dollop of butter. Poached Scrambled Eggs 4 large eggs 2 tablespoons extra-virgin olive oil (optional) Fine sea salt Freshly ground black pepper. 1. Crack each egg into a medium-mesh sieve (or narrow-slotted spoon), letting the thin white drain away. Transfer the remaining yolk and white to a small bowl. Beat the eggs vigorously with a fork for 20 seconds. 2. Set a medium saucepan filled with 4 inches of water over moderate heat. Put a strainer in the sink. When the water is at a low boil, add a few large pinches of salt, then stir in a clockwise direction to create a whirlpool. Pour the eggs into the moving water, cover the pot and count to 20. 3. Turn off the heat and uncover the pot. The eggs should be floating on the surface in ribbons. While holding back the eggs with a spoon, pour off most of the water over the strainer. 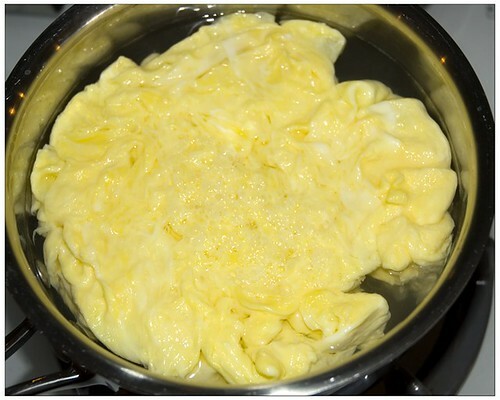 Gently slide the eggs into the strainer and press them lightly to expel any excess liquid. 4. Scoop the eggs into bowls, drizzle with olive oil if desired and season with salt and freshly ground black pepper. (Variations: Serve with butter; smoked paprika; piment d'Espelette; or a spoonful of crème fraîche and a dollop of caviar.) Serves 2. Adapted from Daniel Patterson. To get a pretty similiar result (although, it might have ethical problems like the teflon fry pan) you can also make scrambled eggs in the microwave. 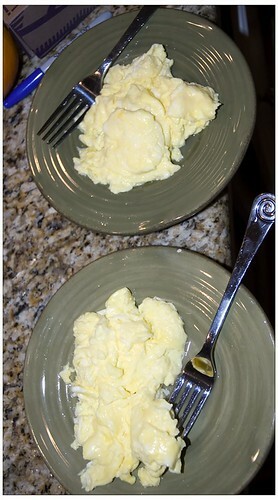 Just beat your eggs (don't have to worry about thin egg whites), put it in a microwave safe bowl, then microwave it for a minute or so. Take it out and scramble it with a fork or something. My Dad makes this for his breakfast everyday. The end result is something that looks pretty much the same as above. I've made that many times too. The poached scrambled eggs are moister and fluffier (but maybe my microwave heats at too high of a temp). However, with the microwave method as you describe, it is easier to add other things to the mix (cheese, onion, bits of sausage, whatever). Microwave is the easiest way to prepare eggs ever - but cooking on full power sometimes makes them spurt and pop, makes a real mess in the microwave. I melt a little butter into the bowl first ... then beat cook the eggs on half power for 90 seconds. If they're not quite cooked then 10 seconds on full power finishes them off nicely. noah's bagels uses a microwave for their egg mitts. those things are really hot... but ohh so good. Oddly, you can also use toaster pouches for this: they are reuseable, and work a treat. I'm pretty sure that due to the Coriolis effect, if you live in the southern hemisphere, you have to stri your water in a counter-clockwise direction. If you're putting a dollop of butter on at the end anyway - why not just cook them the regular way in a regular (stainless steel | cast iron | copper lined w/ tin) pan with a dollop of butter? I like this method for sandwiches, though. Gary, maybe your cooking skillz are better than mine, but in stainless steel pans, there are always significant amounts of eggs that stick to the pan, hard. This is what we've done recently, before discovering the poached method. When Microwaves were first sold to the public in the 60's; they were sold door to door like vacuum cleaners. The salesmen cooked for the prospective buyers....and they always cooked eggs. Always coat the container with melted butter, (any tupperware like container will work), and then work out time according to how many. Lighter and fluffier than any other way. If you use a small cylindrical unit it will overflow and create a egg muffin you can decorate with salsa and cheese. Wedge shaped will make "pizza" shapes. For fried eggs use a micro safe plate coated with butter and then cover with paper plate. Work out time for your taste. By the way, I was one of those guys and those early ovens weighed about 75lbs and cost $600.00. my eggs always stick when i cook them in a pan with butter. use nonstick cooking spray instead and they come out better than with teflon. Sounds like a bit of work :-) Not owning a micro wave oven I will try the toaster pouches, thanx for the tip. R: The Coriolis effect occurs due to a downward motion (water exiting down the drain) in combination with the rotation of earth. It will not affect spinning water in a pan. The Coriolis effect is very weak and often the direction of the "mini-whirlpool" in your sink is random. Dingo: what is in non-stick cooking spray? I don't think the ingredients would be able to pass through my girlfriend's "healthy food only" filter which guards our house. Not all nonstick cooking sprays are the same, but a very common one contains nothing but canola oil and a bit of soy lecithin (derived from soy beans, used to lower the surface tension of the oil so it doesn't pool up on the pan). Nothing to get concerned about. I use an olive oil cooking spray that's nothing but olive oil and lecithin. Lecithin is an emulsifier that's found in stuff like mustard seeds and soy beans and is totally natural. I think the brand is Mozolla? (or something like that) And it's in a strange-looking spray bottle. To keep eggs (or anything else) from sticking to the pan in which they're being cooked, you need to heat the dry pan (if cooking with butter, not too much, or the milk solids burn when you put it in), add the fat, in whatever form, and then let it heat up a little bit too before you add whatever it is that needs to be cooked. The way my not-too-scientific mind imagines it is letting the heat expand the metal and open its little tiny "pores" up, then fill them with the fat so the food won't get in them and get stuck. Nonetheless, this looks like a cool way to cook eggs (for my kids, I can't stand them myself). You don't have to use a store bought non-stick cooking spray: any oil spritzer will do. They have the added benefit of being able to use any kind of oil you choose! Ha, I just looked in our cabinet, and we already have a no-stick spray, with canola, soy lecithin, and propellant. I still think the poached scrambled is more fun. The French classic chefs nailed scrambled eggs a couple centuries ago. Cook them hot and fast. Heat oil and butter to medium or high (important), pour in the whipped eggs (salted to taste); tip the pan to distribute the eggs as you pull back the cooked edges. Take off the heat in 15-20 seconds, max. Immediately place on warmed plates - the heat in the eggs will continue cooking. I just tested this technique - perfect eggs in less than 20 seconds. A SUPERHYDROPHOBIC SURFACE, devised by scientists at UCLA, greatly reduces the friction felt by a fluid as it moves across the surface. It does this by inducing a blanket of air to lodge between nano-posts built onto the surface; the air keeps the fluid from coming into contact with the solid surface (see figure at http://www.aip.org/png/2006/247.htm ). This arrangement is a sort of upside-down hydrofoil, the marine design in which the friction between ship and liquid is lessened by minimizing the contact area, and this in turn is accomplished by keeping the larger part of the hull above the water on pylons. The UCLA scheme is also a bit like an "air-hockey" game, in which a quasi-frictional effect is achieved by having pucks float across a table pierced by holes feeding forced air under the puck. In the new work, a forest of posts one micron in height are etched across the substrate surface. The posts will thereafter trap air which in turn permits fluid flow above with greatly reduced friction. Such a scheme has been tried before, but the UCLA researchers have the sharpest posts and the highest yet density of posts so far. This is important for certain areas for fluid research and for prospective microfluidic applications; the fluid levitation is maintained even when the fluid is pressurized. Applications are also likely at the macroscopic level. For example, submarines and torpedoes coated with the slippery nanoengineered material would glide through the sea under much less propulsion. How effective is this approach? It's difficult to specify a single drag-reduction amount since so many factors are at play: the surface area, the liquid speed, the viscosity, the fluid pressure, the gap width of the channel, and so on. For instance, a 90% drag reduction can be achieved for a channel gap of 10 microns; a 55% reduction for a 100 micron gap; and a 11% reduction for a 1-mm gap. Therefore, a figure of merit often used by the researchers is the "slip length," which is roughly the extrapolated distance beneath a solid surface at which a no-slip boundary condition would hold true (again, see the figure). A large slip length is good; and the UCLA team has observed the largest slip values yet seen, even under pressurized conditions. Thank you so much for this. 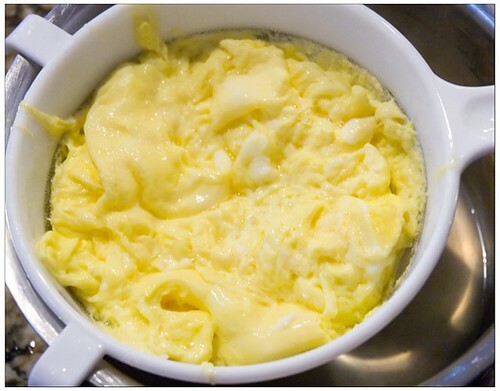 There is a restaurant in my town that has been making scrambled eggs like this for decades now and it has driven me crazy trying to figure out how they did it. Blogged your page and a picture. I've found no trouble at all using a properly seasoned Anodized Aluminum pan for cooking eggs.Just heat the pan until it is very hot (most sticking is due to the eggs or other food being added to a cold pan), add a cold fat of some sort (so that it won't burn), and add your eggs. When you are done with the pan, simple leave it on the heat until it smokes, plunge it under your faucet, and, while the water in the pan is still bubbling, use a wire brush to remove any bits of food that remain. Then wipe down the pan and put away. Never, ever, use soap, which will ruin the seasoning. Kept properly seasoned, a 4 or 5 year old anodized pan will outperform a 4 or 5 year old teflon pan. It seems to me that the entire health benefit of eating eggs lies in the proteins. Microwave ovens, however, don't allow the proteins of eggs to fully denature - giving it a spongy or tough texture rather than the preferred light and rubbery one. Cooking eggs at too high a temperature in a pan causes the proteins to break down. One sign of protein break-down is evident when the edges of eggwhites turn into crispy translucent bubbles. Much of the flavor and even the safety of cooked foods comes from the temperature as well as the time the food is cooked, says ZoeAnn Holmes, profession of nutrition and food management at Oregon State University. Fast microwave cooking disrupts the way proteins unwind as raw food becomes cooked food. Proteins are made of wound-up chains of amino acids. Their unwinding, or "denaturing," makes a raw egg firm or a rubber band brittle. It takes heat to pach an egg, but the best poached eggs are cooked slowly over steam water so the twisted protein molecules have time to unwind slowly, Holmes says. The molecues in an egg become rubbery when they are zapped by a microwave and unwind too fast. For another kind of microwave cooking (think your cell-phones are safe? ), you might want to check out the article at Wymsey. I have had the same two cast-iron skillets since I moved out of my mom's house 15 years ago. One big, one small. My smaller one is very well seasoned, and perfect for scrambled eggs. They never stick. I just use a little oil or butter. I almost never put soap in my skillets, just wash them quickly with hot water and a cloth. Dry them right away, then put a thin layer of oil on them between uses. My big skillet gets used for dinner more, and sometimes doesn't get washed right away and then I have to soak it for 15 minutes. I think this is why it is not as well seasoned as the small one. Still, it is pretty well seasoned, and I usually don't have any problems with eggs sticking. Also, I follow the Frugal Gourmet's rule "hot pan, cold oil, food won't stick". I think the main point of the rule is that you don't want your oil to stay hot too long before you add the food, because it starts to break down. This page contains a single entry by Seth A. published on January 10, 2006 10:49 AM. High court to weigh DNA in death row case was the previous entry in this blog. Overlord meme is the next entry in this blog.